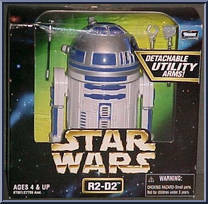 has a removable cape and Laser Pistol. (with 2 Blasters, Base) Held captive in the Death Star, Princess Leia is interrogated by Darth Vader and Grand Moff Tarkin. 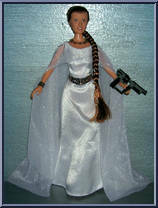 Leia is ordered to reveal the location of the secret Rebel base or see her. . . Her ship under attack from Darth Vader's Star Destroyer, Princess Leia downloads the secret Death Star plans into R2-D2 for safe-keeping . 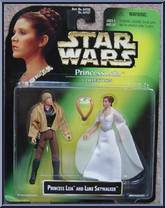 After being stunned by a stormtrooper blast, Leia became a pr. . . While repairing his new droid R2-D2, young Luke Skywalker unwittingly short circuits its recording system, causing a holographic image of the young Princess Leia to appear. She implores the help of O. . .
Six years after the destruction of the second Death Star, the galaxy is thrust into turmoil. A reborn evil threatens to enslave the galaxy, and the Republic's closest friend - Luke Skywalker - may bec. . .
A strong-willed warrior who fought for the Rebel cause with great courage, Princess Leia Organa was a natural born leader of the Rebel Alliance. The princess always carried herself with a regal air, w. . .
Held captive in the Death Star, the princess is interrogated by Darth Vader and Grand Moff Tarkin. 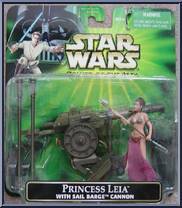 Leia was ordered to reveal the location of the secret Rebel base or see her home planet of Alderaan d. . .
An accident during a furious speeder bike chase leaves the princess without a way of finding her Rebel companions. 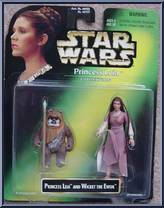 Befriended by Endor's Ewok civilization, Leia is once again united with her friends, . . .
Imperial snowtroopers have been spotted inside Hoth's Rebel base. 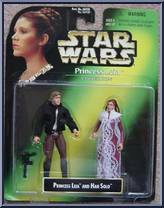 Little time remains for Princess Leia and Han Solo to make it to the Millennium Falcon and escape with their lives. Disguised as the bounty hunter Boussh, Leia infiltrated Jabba's palace as part of a small rescue team to free Han Solo, Leia was captured and forced to endure the status of Jabba's slave until the opp. . . Height: 1.5 meters Status: Princess of Alderaan, Imperial Senator, Cell Leader of Rebel Alliance Classification: Human Affiliation: Rebel Alliance Weapon of Choice: Blaster After many unsuccessfu. . . The formidable sight of Darth Vader strikes a reflex reaction in Han Solo's trigger finger, but the Dark Lord's power proves too great and Princess Leia and her band of Rebels are taken captive. The beautiful Princess Leia, Senator and Cell Leader for the Rebel Alliance, rewards the young Luke Skywalker for his heroic role in the destruction of the Imperial Death Star. The Ewok named Wicket was the first of his clan to find Princess Leia after she crashed a speeder bike in the dense woods of Endor. Their friendship allied the Ewoks and Rebels so that together they c. . . Height: 1.52 Meters Status: Princess of Alderaan, Imperial Senator, Cell Leader of Rebel Alliance Classification: Human Affiliation: Rebel Alliance Weapon of Choice: Commandeered Aratech 74-Z Military. . .
Jabba the Hutt planned to throw Han Solo to the Sarlacc in the Great Pit of Carkoon. 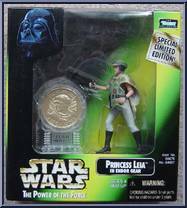 But Princess Leia killed Jabba by choking him with the chains holding her prisoner, then rigged the Sail Barge's la. 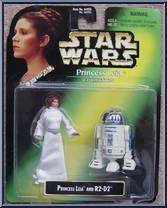 . .
Princess Leia Organa, the beautiful and spirited leader of the Rebel Alliance, is forced to flee from Imperial forces when the Rebel base on Hoth is attacked. 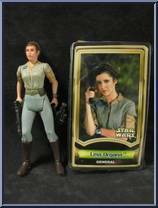 Landing on Bespin's Cloud City, she and h. . .
A princess on her homeworld of Alderaan, Leia Organa is a strong-willed woman of action. After Alderaan was destroyed by the first Death Star, she became a full-time member of the Rebel Alliance. She . . .